July is a month of abundance in my kitchen garden. After months of hard work come the blissful rewards: a walk down the potager path at this time of year is like a trip to a private farmers market. New potatoes, peas, fresh herbs of every kind, strawberries, raspberries, early blueberries, edible flowers, garlic scapes, cherry tomatoes, broccoli, tender young onions, and the list goes on. With so much fresh produce to choose from, you might imagine that my meals are endlessly varied. But with a busy work schedule and a long list of garden chores, I sometimes get stuck in a lazy cooking rut. Pasta, pasta, pasta … Ho hum. Thank goodness for great cookbooks and beautiful food blogs! Some people have stacks of paperback novels or a loaded Kindle beside their bed. Me? I have cookbooks and bookmarked food sites. Funny, I always seem to wake up hungry. Surprised that I still have snow peas? 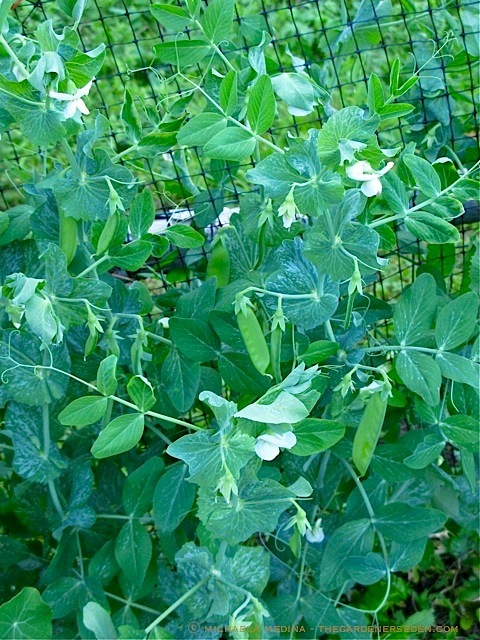 This is part of my second crop, and the young vines are just starting to produce baskets of sweet, tender pea pods. If you’ve been following this blog for awhile, you may remember last summer’s post on succession planting (click here to read my “Love Me Two Times Baby” post). For a continuous supply of fresh produce, sowing seed and planting new vegetable starts is an ongoing, spring through autumn process in my kitchen garden. Certain crops —like spinach, beets, broccoli rabe and peas— prefer cooler soil temperatures for best germination, and other crops —such as green beans, cucumbers and summer squash— require warm soil to get a good start. Timing is everything in the vegetable garden, and because I am so busy, I need to jot seed-sowing and harvesting reminders in my calendar; lest I forget to plant and run out of fresh produce! 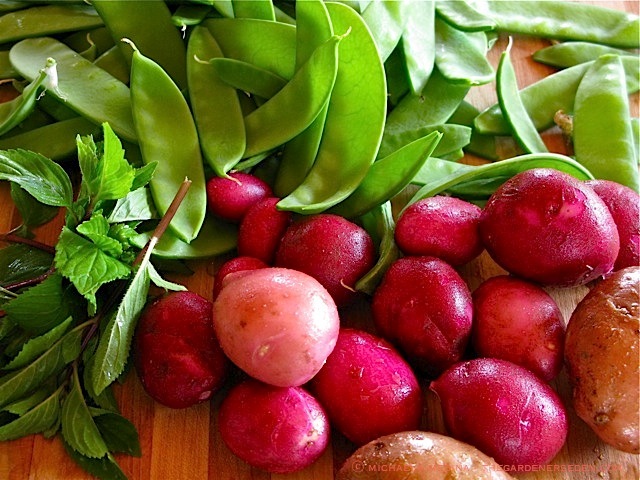 New potatoes are another one of my favorite, early summer vegetables. 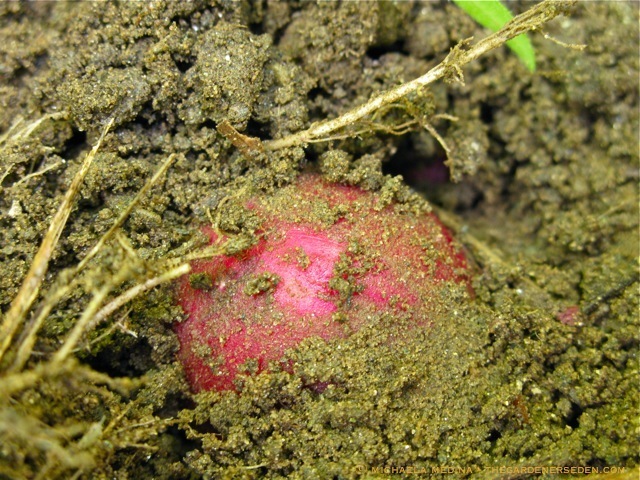 Many early-season potato varieties begin to bloom approximately 60 days after planting. 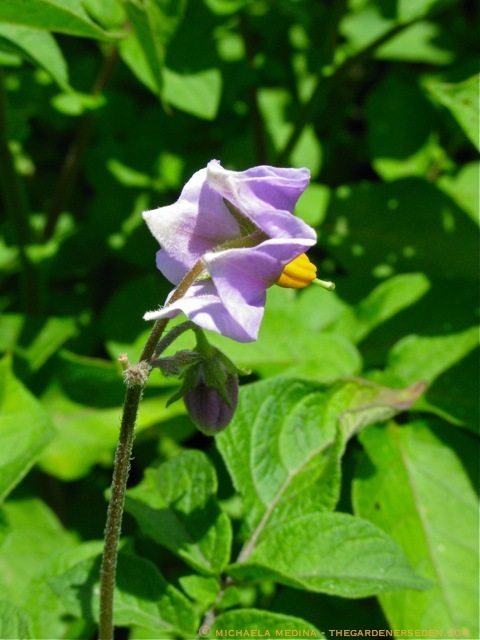 Flowering is a good indication that new potatoes —those flavorful baby spuds that command such a premium at the market— have begun to form. 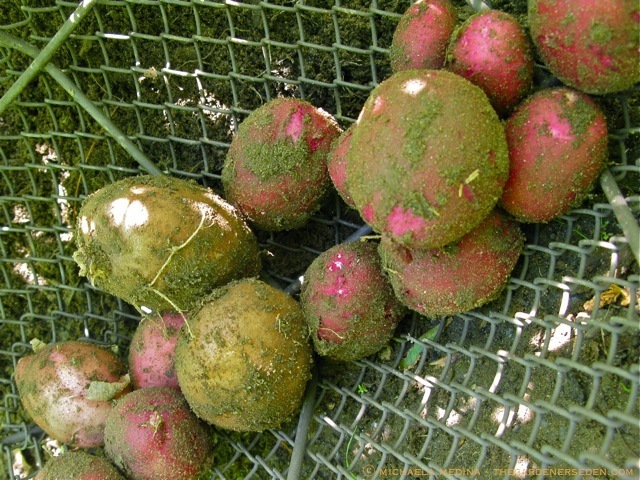 Harvest these young jewels carefully –always by hand– fishing about the outside of earthen hills and pulling just a few potatoes from each plant. Of course, if you have an large potato patch (I think I over-did it this year, myself), you can harvest entire plants while the potatoes are small, if you wish. When sneaking just a few spuds early, be sure to carefully re-mound the soil or straw mulch around the potato plant, and save the main crop for harvest later on in the season. 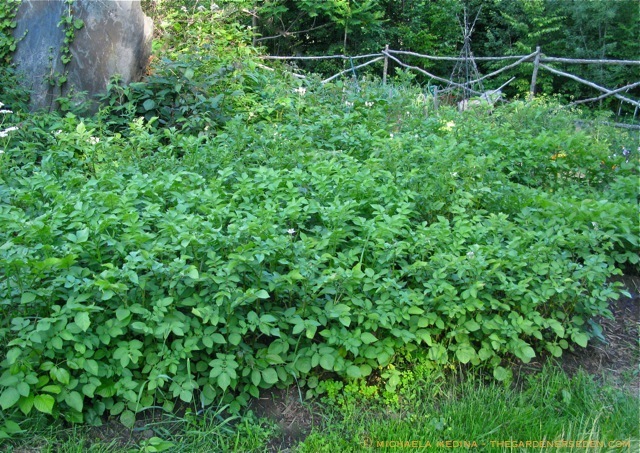 I like to stagger my potato plantings so that tender, flavorful, new potatoes are an option later in the season as well. This patch of potatoes was planted in late April & for the past few weeks, several varieties have been blooming and producing flavorful new spuds! Slice the potatoes thinly and boil in a small pot of water for approximately 8 minutes. Do not overcook! Drain and set aside to cool. 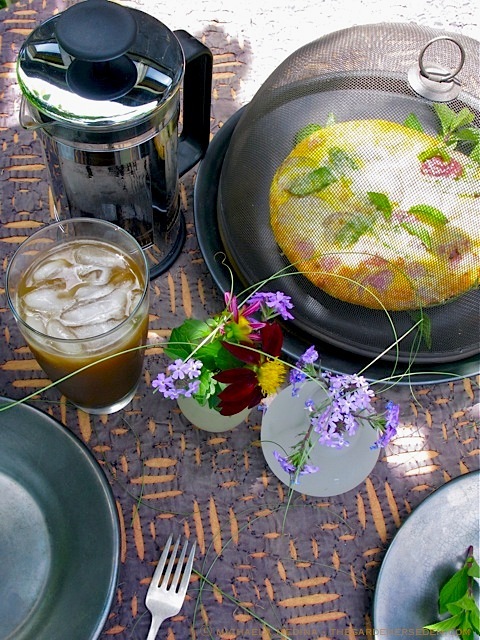 Melt butter on medium-low heat in an 8″ oven-proof frying pan (or frittata pan). Cook onion slices in the butter 8-10 minutes (do not brown). 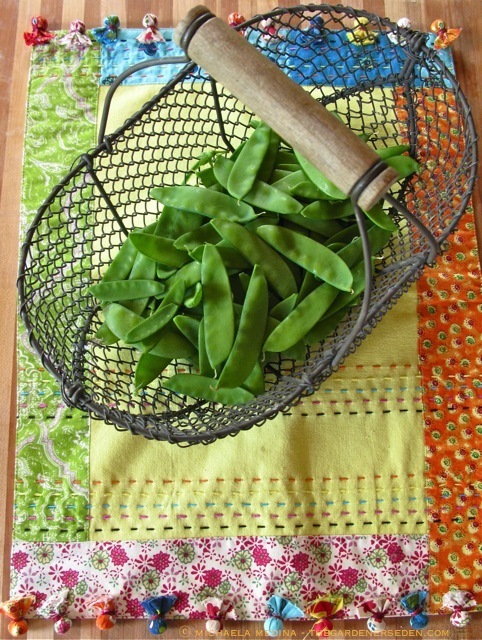 Add snow peas and turn off the heat (toss and allow the peas to cook in the radiant heat of the pan). In a medium sized bowl, mix potatoes, mint; adding salt and pepper to taste. Add this mixture to the pan and toss ingredients well. Pat everything into an even layer. In a small bowl, lightly whisk eggs together with a bit of salt and pepper. Pour the mixture into the frying pan, evenly distributing the liquid over the vegetables. Shake the pan a bit to be sure the egg mixture reaches sides and bottom. Sprinkle the top with an even layer of cheese. Turn the burner back on and cook for 5-7 minutes, or until egg at sides of pan appears to have set (shake lightly). When eggs seem to be setting, place the pan under the broiler for approximately 5-8 minutes, cooking until just golden brown. Watch carefully! 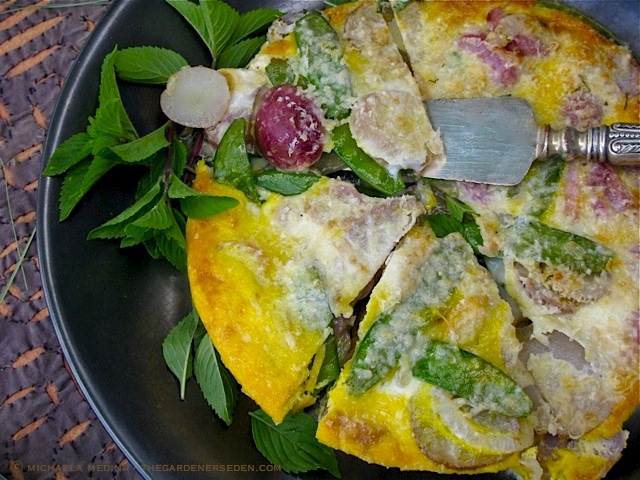 Remove the frittata from the oven and allow the pan to cool for several minutes. 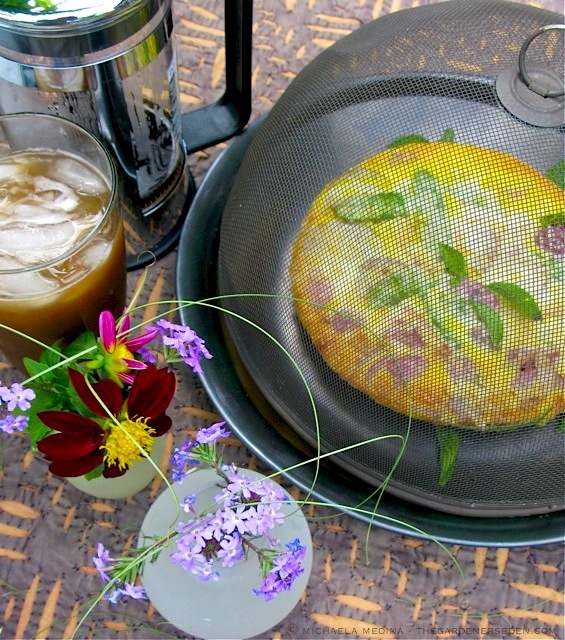 Loosen edges and bottom of the frittata from the pan with a silicone or rubber spatula. Place a full size dinner plate over the pan and, while holding both together tightly, in one smooth move, invert. 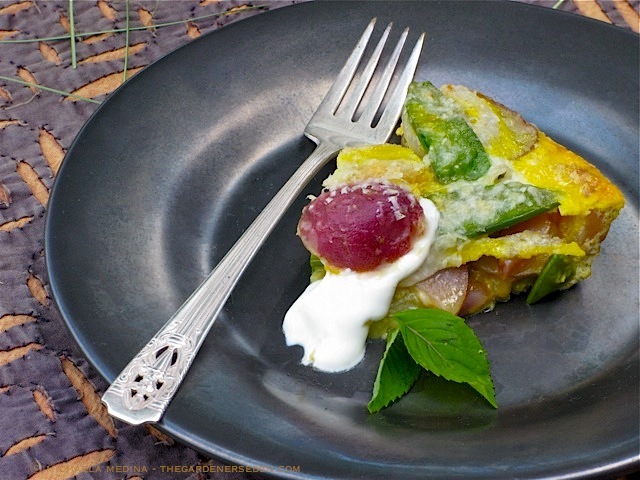 Place a serving plate over the dinner plate and repeat the process (this will allow you to serve the frittata, browned-side up). *To make lemony mayonnaise: Measure 1/4 cup of regular mayonnaise (homemade is best but store bought works too) into a bowl. Add 1 tsp of grated lemon rind and 2-6 tsp fresh squeezed lemon juice (use more or less lemon to suit your personal taste). Whisk together and add a bit of salt and pepper. Chill. 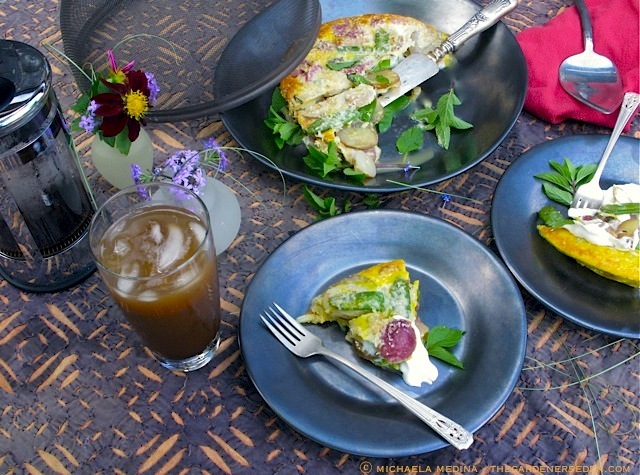 I love no grocery-store-trip, summertime meals from my garden! 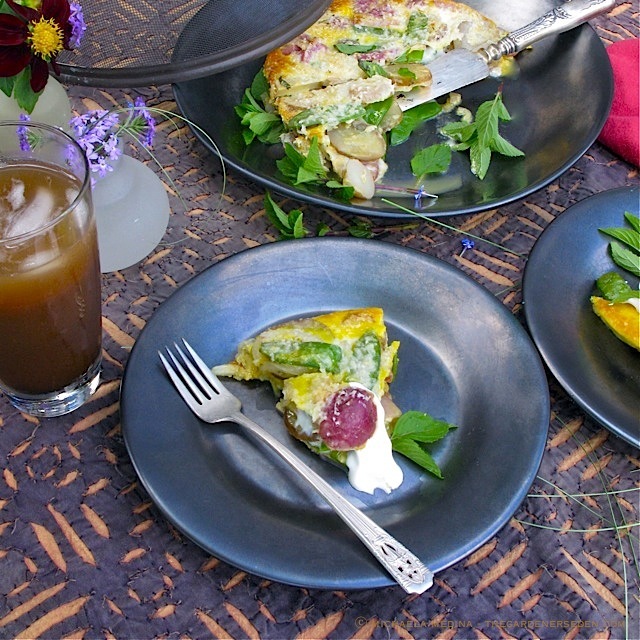 § 2 Responses to Summertime Brunch from the Potager: New Potato, Snow Pea & Mint Frittata With Delightfully Lemony Mayonnaise …"
Thanks for sharing the recipe. 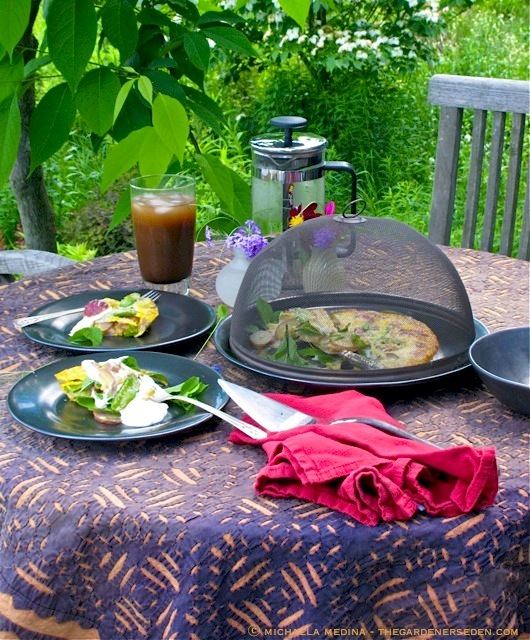 I have been looking for something new to try with my abundance of fresh eggs. 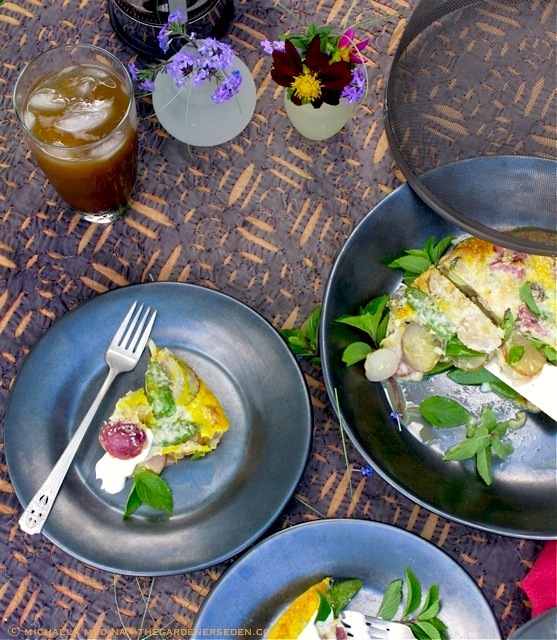 You are currently reading Summertime Brunch from the Potager: New Potato, Snow Pea & Mint Frittata With Delightfully Lemony Mayonnaise … at The Gardener's Eden.